District of Muskoka Chair John Klinck. MARCO (Mayors and Regional Chairs of Ontario) has named Karen Redman as Chair and John Klinck as Vice Chair for the current term of Council. MARCO brings Ontario regional chairs and large, single-tier city mayors together to discuss common issues of concern, including provincial and federal matters. They work together to advocate for policy action and change on behalf of MARCO members. MARCO represents more than 9.7 million residents of Ontario. 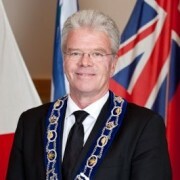 District of Muskoka Chair John Klinck has been elected Vice Chair of MARCO, and has also been re-appointed to serve as their representative on the Federation of Canadian Municipalities (FCM) Board of Directors. FCM is the national voice of municipal government, with 2,000 members representing 90 per cent of Canadians. Municipal leaders from across Canada assemble each year to set FCM policy on key issues. FCM advocates for municipalities to ensure citizens’ needs are reflected in federal policies and delivers tools that help municipalities tackle local challenges. As residents of both Waterloo Region and Muskoka, we feel well represented. Congratulations John! Good work for many years to come!